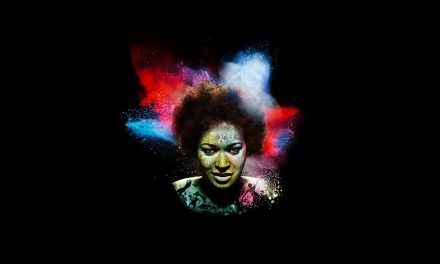 It seems strange to think that it has been over 20 years since Kanya King MBE founded the much needed Music of Black Origin Awards or MOBOs. 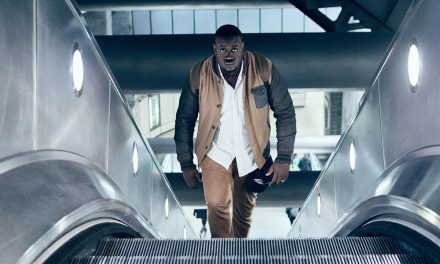 Since then we have had the rise of other respected creative industry and community awards; exemplars being the annual Screen Nation, and Back2Black (founded by Charles Thompson MBE in 2003 and Fredi ‘Kruga’ Nwaka in 2014 respectively). 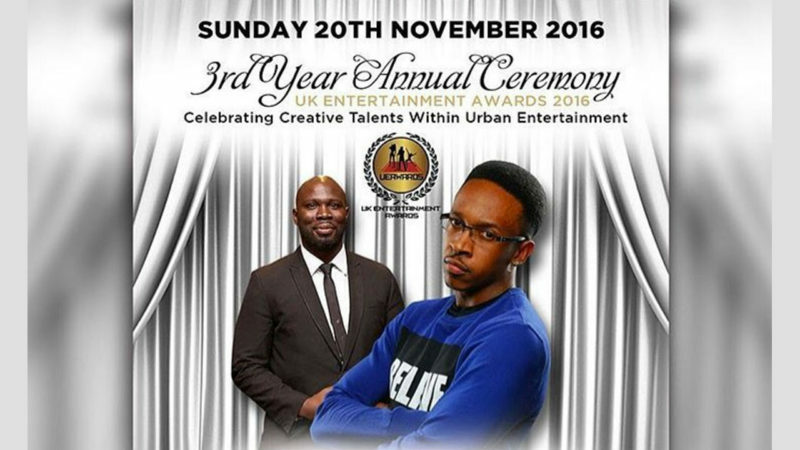 Last Sunday was the return of the UK Entertainment Awards (UEA), with categories in poetry, acting, television, film, music and radio; a platform that strives to recognise “the talents and inspirations which are not often acknowledged by mainstream media”. I’ll be honest and say I’m a little tainted when it comes to these things; instances such as a ceremony being so delayed my friend and I went for a leisurely dinner until proceedings started comes to mind. But moreover it is very easy to get the balance of things wrong with award shows. That said, co-founders Sherine Atkins and Shinel Crichlow must be applauded not only for their vision, but the execution of the 2016 UEA’s. Photographs at the step and repeat banner inside the West India Quay based London Marriott Hotel made for a warm welcome. Followed by a smiling event team (some of whom where young uniformed volunteers), eager for their guests to enjoy the plentiful canapés and complimentary wines before proceedings began. The stage hosts, Travis Jay and KG the Comedian (from ‘The Vibe’ – Bang Radio) were a formidable duo who had us engaged throughout. 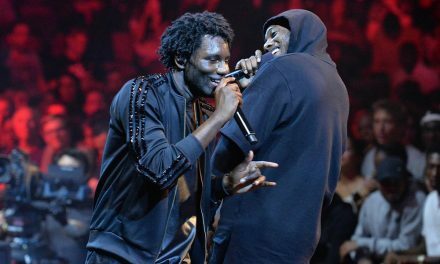 From their banter and improvisations, which included an impromptu clash with MC Bushkin from the legendary Heartless Crew, to acknowledging the performers, presenters and winners with decorum. The comedic pair knew exactly when to be playful and when to be formal. The Dylema Collective (who were up for an award) and consist of Dylema Yohan, David and Toby opened the show. The keyboard, guitar and a cajón player backing the deep and weighty voice of their poet/singer created a funk/neo-spoken-soul combination that was well received. An impromptu gospel song by Rachel Kerr as she came to collect her award was as beautiful as she was, dedicating her award to her “better half” and passionately acknowledging the UEA for including gospel as a category. The performance by a bashful 18 year old talent called Lottie and the trailer of Kojo and Sheridan De Myers’ soon to be released film, The Weekend (starring Wall of Comedy founders aka Jovian Wade, Percelle Ascott and Dee Kaate) were well timed interludes. MOBO award winner Lurine Cato’s outstanding performance began with an inspirational message on success and perseverance followed by a gospel adaption of Beyonce’s, Running. Lurine literally made people hold their breath. I’m neither a fan, crier or particularly religious but her talent and purpose were tear inducing and well worthy of the standing ovation she received. Revealing the 17 winners was perfectly timed, with enough variety in the categories to make you feel that the creative arts and entertainment were well represented (the 7.30pm until 10pm event ran smoothly throughout and ended on time). I was pleased to see the first category up was poetry, with that being my first love as a writer, keen to find out who the recipient would be, especially as last years worthy winners were, Rhythm of Men – a well loved collective and my UK favourite. Up this year were M.Artz (managed by the Natalie Stewart of Floetry aka ‘The Floacist’), Mina West and Nego True. The nominations in each category were strong overall with 64 across the 16 that the public voted for and one special Legendary Award recipient. *Sandra Cross scooped the UEA’s first ever ‘Legendary Award’. As enjoyable as the evening was, there were some areas that needed attention. A nomination name list which omitted one of the winners and had multiple typos (not only is a shame for those nominees but means for me double checking all 65 names, a journalistic and proof reading nightmare that lasted hours). An understaffed bar at the interval, which to be fair the Marriott were responsible for staffing. Finally, my disappointment in the White Yardie win (cultural appropriation becoming normalised aside). 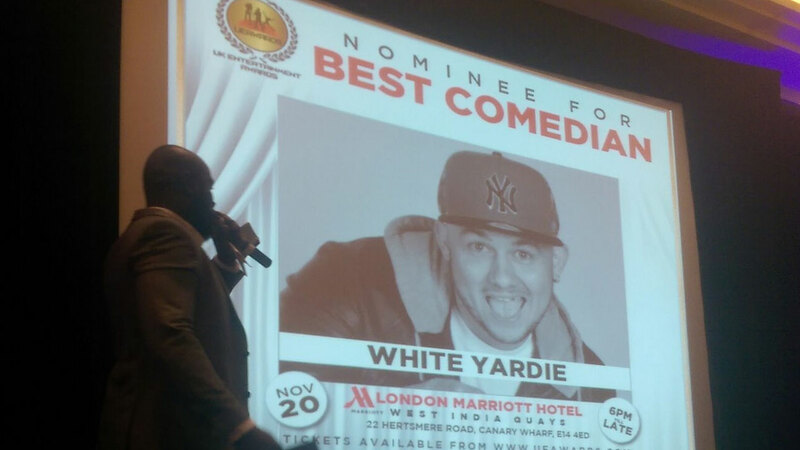 He received the most public votes last year and this, winning over both Aurie Styla (BBC 1Xtra’s ‘The Comedy Club’) and Judi Love. 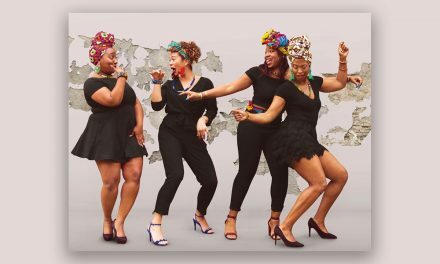 Love in particular has had a stellar season online, well supported gigs and with her recent ITV debut as a panelist on Jimmy Akingbola’s, I’m Sorry I Didn’t Know is absolute proof she has had a knock out year generally. It was a shame too that although the audience was full and present, with ticket pricing ensuring that this was an accessible, inclusive event, (I’m not sure if this contributed to why), in contrast many of the nominees, and more noticeably winners were no shows. 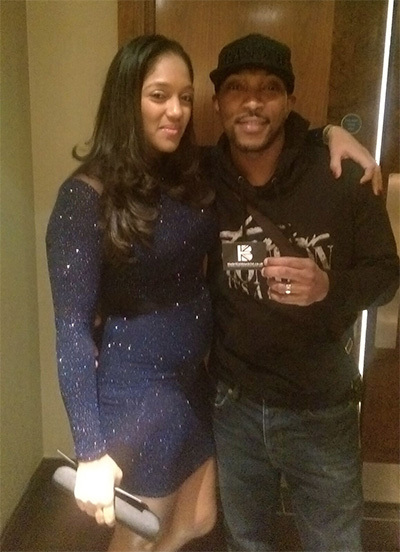 It was great to have Danielle and Ashley ‘Asher D’ Walters, Daddy Ernie (from Choice FM’s golden era) and, as mentioned earlier, Bushkin in the building. Summary With just a few small details that need attention, overall the UEAs were an enjoyable evening full of laughter and inspiration. With such amazing support and the wonderful audience and management/event team (who should also be applauded), this award ceremony can and should go from strength to strength. I very much look forward to next year. 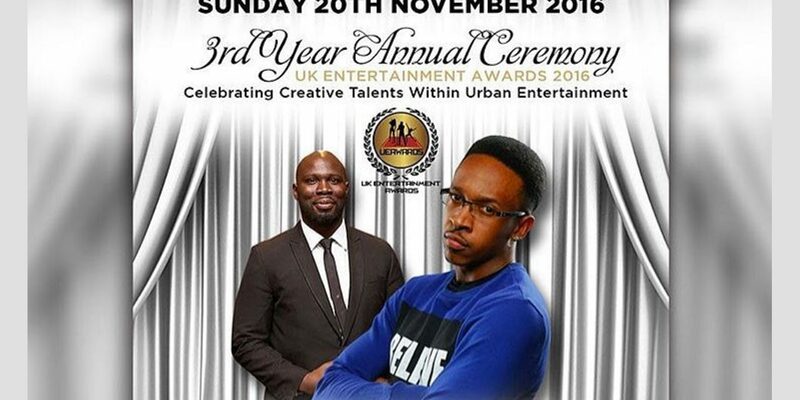 NextGiles Terera Delights With A New Solo Show! Final Performance Tonight!